Franklin Delano "Frank" Gore (born May 14, 1983) is an American football running back for the Buffalo Bills of the National Football League (NFL). He played college football for the University of Miami, and was drafted by the San Francisco 49ers in the third round of the 2005 NFL Draft, playing with them from 2005 to 2014. He is the 49ers all-time leader in rushing yards and rushing touchdowns. In his NFL career, Gore has had nine 1,000-rushing-yard seasons and five Pro Bowl selections. While achieving some personal success, he struggled with a team that suffered numerous losing seasons until he and the 49ers achieved a 13–3 record in the 2011 season under new head coach Jim Harbaugh. In 2011, the 49ers won the NFC West division and reached the NFC championship game. In 2012, Gore helped lead the 49ers to Super Bowl XLVII, although they would lose to the Baltimore Ravens. In 2011, Gore became the 49ers career rushing yards leader and in 2012, he became the 49ers rushing touchdowns leader. In 2014, Gore became the 29th player to have rushed for over 10,000 yards. He also spent three seasons with the Indianapolis Colts and a year with his hometown team Miami Dolphins. He is currently the oldest active running back in the league. Gore was born in Miami and grew up in Coconut Grove, Florida. He attended Coral Gables High School, where he excelled as a running back on the football team. He had two notable record-breaking games. Against Miami Northwestern High School, he had a then-career high 293 yards and two touchdowns on 10 carries. In the next game, he broke that record with 319 yards and six touchdowns on 13 carries against the third-ranked defense in the nation. During his senior year in 2000, Gore broke several Dade County single-season records, including rushing yards (2,997) and touchdowns (39). Heavily recruited, he was named the top prospect in Dade County by The Miami Herald, fourth in the state of Florida, and fifth nationally. Gore had a scholarship to attend the University of Miami under new head coach Larry Coker. Gore made his collegiate debut against the Penn State Nittany Lions on September 1. He had six carries for 15 yards against the Nittany Lions. In the next game against the Rutgers Scarlet Knights, he had six carries for 78 yards and his first career collegiate rushing touchdown. On October 25, Gore had a breakout game against the West Virginia Mountaineers. He recorded six carries for 124 yards and two touchdowns. In the next game against the Temple Owls, he had 11 carries for 86 yards and a touchdown. In addition, he recorded his first career receptions, which was for 14 yards. On November 24, he had eight rushes for 46 yards and a touchdown against the Washington Huskies. As a true freshman for the Miami Hurricanes football in 2001, Gore totaled 562 yards with five touchdowns on 62 carries (a 9.1-yard avg) as a backup to Clinton Portis on Miami's 2001 National championship winning team. Gore has the third-best season total in school history by a freshman and was named Sporting News' Big East Freshman of the Year. Gore suffered a torn anterior cruciate ligament (ACL) in his left knee before spring practice in 2002 and spent the following season recovering from knee surgery. Before his injury that year, Gore beat out future NFL running back Willis McGahee in the spring of 2002 for the role as the Hurricanes' starter. Gore returned from his injury in the 2003 season. He started the season off strong against the Louisiana Tech Bulldogs on August 28. Against the Bulldogs, he had 21 rushes for 118 yards and two receptions for 33 yards. In the next game against the in-state rival Florida Gators, he put together a stellar performance with 24 carries for 127 yards and two touchdowns to go along with seven receptions for 54 yards. Gore's hot streak continued in the next game against the East Carolina Pirates, where he had 24 carries for 134 yards and a touchdown. After a game against the Boston College Eagles, Gore played in his final game of the 2003 season against West Virginia. Against the Mountaineers, he had four carries for 15 yards before tearing his ACL again, which ended his season. Gore finished the 2003 season with 89 carries for 468 yards and four touchdowns. Gore returned from his ACL injury to have a solid final season with the Hurricanes. On September 10 against the Florida State Seminoles, he had 18 carries for 89 yards and a touchdown to start the season. In the next game against the Louisiana Tech Bulldogs, he had 12 carries for 61 yards and a touchdown. In the next game against the Houston Cougars, he was held to only eight yards on six carries but recorded his third consecutive game with a touchdown. On October 2, Gore had 15 rushes for 124 yards against the Georgia Tech Yellow Jackets. On November 6, he had 20 carries for 105 yards and two touchdowns against the Clemson Tigers. He followed that up with 28 carries for 195 yards and a touchdown against the Virginia Cavaliers in the next game. In the final game of his collegiate career, he had 25 carries for 80 yards against the Florida Gators in the Peach Bowl. Gore was selected in the third round with the 65th overall pick of the 2005 NFL Draft by the San Francisco 49ers. He was the sixth running back to be selected in the 2005 NFL Draft. In addition, he was the third of five Miami Hurricanes to be selected that year. He signed a three-year contract with the team on July 28, 2005. Gore played in 14 games, starting one, in the 2005 season. He was inactive for two contests with a groin injury. He finished the season seventh among all NFL rookie running backs in rushing average with 4.8 average per run. He led the team in rushing with 608 yards on 127 carries and three rushing touchdowns. Gore also caught 15 passes for 131 yards. Gore's season was the first time a rookie led the 49ers in rushing since 1990, when Dexter Carter paced the team with 460 yards. His 608 yards rushing was the highest for a 49ers rookie since Roger Craig had 725 yards rushing in 1983. Gore rushed for 17 yards on four carries and caught two passes for 21 yards in his first game against the St. Louis Rams. He later rushed for 42 yards on seven carries with a 5.4-yard average against the Dallas Cowboys. He led the team with 89 yards on nine carries and recorded a then career-long 72-yard touchdown run in the fourth quarter at the Washington Redskins. The touchdown was the longest run from scrimmage by a 49ers player since running back Kevan Barlow had a 78-yard rush against the Pittsburgh Steelers. The touchdown run was fifth-longest run from scrimmage by a 49ers rookie. He led the team in rushing for the third straight week with 55 yards on 14 carries (3.9-yard avg.) at the Chicago Bears, with a 19-yard long. He made his first NFL start against the Jacksonville Jaguars, amassing over 100 combined yards with 79 yards rushing on 19 attempts for a 4.2 yard average with three receptions for 57 yards. Gore had his first two-touchdown game against the St. Louis Rams, with a 10-yard scoring run in the second quarter and a 30-yard score in the fourth quarter. In a game against the Houston Texans, he registered his first 100-yard game with 108 yards on 25 carries. Following the season, he had major surgery on both shoulders. Gore emerged as one of the top running backs in the NFL in his first full season as the starter. Gore carried the ball 312 times for a franchise record 1,695 yards, eclipsing Garrison Hearst’s 1998 record of 1,570 yards. He became the first member of the 49ers to lead the NFC in rushing yards. He also set a franchise record with 2,180 combined yards (1,695 yards rushing and 485 yards receiving), breaking Hearst’s single season record of 2,105 total yards (1,570 rushing and 535 receiving) set in 1998. His total placed him second in the NFC to Steven Jackson (1,528 rushing and 806 receiving, 2,334 total) and fourth overall in the entire NFL. In the 49ers’ first meeting against the Seattle Seahawks, Gore set the 49ers’ single-game rushing record by totaling a career-high 212 yards on 24 carries, besting the 201 yards by Charlie Garner on September 24, 2000 against the Dallas Cowboys. Gore had nine 100-yard rushing games in 2006, giving him ten for his career. His nine 100-yard games in 2006 shattered the franchise record for most 100-yard games in a season. Garrison Hearst (1998) and Roger Craig (1988) each had six 100-yard games in a season. Gore was the first 49ers running back to have three-straight 100 yard games since Garrison Hearst had a 49ers-record four straight 100-yard games during a stretch in 1998. In those three weeks, Gore set the team record for most rushing yards in a three-game span. Gore's breakaway ability helped him finish the season with 5.4 yards per carry, placing him third in the entire NFL, behind only Michael Vick (8.4 YPC on 123 carries) and Maurice Jones-Drew (5.7 YPC on 166 carries). The 5.4 yards per carry are tied for the second best in 49ers history. Among players with over 300 carries, however, Gore’s season puts him in elite company. Very few times has a player averaged as many yards per carry as Gore did, while carrying the ball over 300 times. The players ahead of him are all Hall of Famers and feature three 2,000-yard rushing seasons. Gore finished with eight rushing touchdowns, tied for the third most in a season by a 49er. He finished the season with a team-leading 61 receptions. Only two other teams had a running back as their leading receiver: New Orleans (Reggie Bush) and Philadelphia (Brian Westbrook). Of those, only Gore and Westbrook also led their team in rushing. He also caught his first receiving touchdown of his career at Seattle, when quarterback Alex Smith avoided a sack and found Gore along the left sideline for a 20-yard score. He led the NFL with 16 rushes for 20 or more yards. Gore earned NFC Offensive Player of the Week honors twice during the 2006 season. He grabbed the honor in Week 5 after rushing for 134 yards on 27 carries, and catching three passes for 38 yards, against the Oakland Raiders. He also won in Week 11 after his franchise record 212 rushing yards, and 26 yards on four receptions, against the Seattle Seahawks. After Gore’s tremendous season, he was named the starting running back to the NFC Pro Bowl team. It was Gore’s first selection to the Pro Bowl. Gore broke a bone in his hand in the non-contact Training Camp drill on July 30 and missed the entire preseason. On September 13, Gore's mother died, due to a kidney disease. He missed a practice, but returned to the team and scored two touchdowns the following Sunday in a 17–16 win over the St. Louis Rams. Gore's best game came against the Arizona Cardinals, where he recorded 116 rushing yards and had 11 receptions for 98 receiving yards and two rushing touchdowns. He finished the season with 1,102 rushing yards and 436 receiving yards. Gore began the 2008 season against the eventual NFC Champion Arizona Cardinals, where he rushed for 96 yards on only 14 carries. Despite his impressive performance, which also included a 41-yard touchdown run, the 49ers lost, 23–13. In Week 3, he dominated the Detroit Lions, rushing for over 120 yards with a touchdown in a 31–13 victory. The following week against the New Orleans Saints, Gore outrushed Reggie Bush, although the 49ers were defeated, 31–17. In Week 6, Gore had his second 100-yard game of the season, as he rushed for 101 yards on 19 carries in a 40–26 defeat against the Philadelphia Eagles. In a Week 17 victory against the visiting Washington Redskins, Gore became the first running back in 49ers history to rush for 1,000 yards or more in three straight seasons. In the 2008 season, Gore finished with 1,036 rushing yards, six rushing touchdowns, 373 receiving yards, and two receiving touchdowns. After being nearly shut down in Week 1 against the Arizona Cardinals, Gore had a career day the following week in the home opener versus the Seattle Seahawks. Gore rushed for 206 yards for a 12.8-yard average, including a 79- and an 80-yard touchdown run, becoming the second player in NFL history to rush for two touchdowns for 75 yards or more in a single game, with the other being Hall-of-Fame running back Barry Sanders. After missing his next two games against the St. Louis Rams and Atlanta Falcons due to an ankle injury, Gore returned in Week 7 against the Houston Texans. While he had a successful game against the Chicago Bears in Week 10, gaining 104 yards with a touchdown, he was used less in the 49ers' offensive game plan in the following three weeks, after the team adopted more of a spread offense. In the 49ers' second divisional game against the Arizona Cardinals in Week 14, however, Gore had one of his most successful games of the season, rushing for 167 yards on 25 carries and one touchdown. In the 49ers' game against the Philadelphia Eagles in Week 16 of the season, Gore had 16 carries for 107 yards against an Eagles team that had not given up a 100-yard game in 22 consecutive games. Gore was named a first alternate for the 2009 Pro Bowl. On January 20, 2010, Steven Jackson announced he would not be playing in the Pro Bowl because of injury, so Gore was named to the 2010 Pro Bowl in his spot, the second of his career. Gore had a productive start to the season rushing for 853 yards and three touchdowns. In Week 3, against the Kansas City Chiefs, he had nine receptions for 102 receiving yards, his only career game with over 100 receiving yards. He had rushed for four 100-yard games before fracturing his right hip in a Week 12 win over the Arizona Cardinals, ending his season after the 49ers put him on IR. During the offseason, the 49ers hired Jim Harbaugh to be their new head coach and built themselves around a combination of a great running game, a supplemental passing game and a power house defense. This combination proved to be effective for Gore and the 49ers, leading them to a 13–3 record in the regular season and a playoff spot for the 49ers, their first such appearance since 2002 along with a first round bye. In the first three games of the season, Gore did not perform well, rushing for 148 yards on 59 carries for only one touchdown. However, after Week 3, this changed. In Week 4, the 49ers were down 23–3 at the end of the first half when quarterback Alex Smith and Gore both led drives to make the final score 24–23 and a 49ers win. Gore rushed for 127 yards and rushed for the game-winning touchdown when four minutes were left in the game. Against the Tampa Bay Buccaneers, Gore rushed for 125 yards and one touchdown in the 48–3 win for the 49ers. However, his performance in that game was eclipsed by his performance against the Detroit Lions, where he rushed a season high of 141 yards in 15 carries and a touchdown in a 25–19 win for the 49ers, ruining the Lions 5–0 start. The next few games went pretty well for Gore, rushing for 134 yards and a touchdown against the Cleveland Browns and 107 yards against the Washington Redskins, becoming the 49ers record holder of most consecutive games with 100 yards (5). However, against the Giants, Gore had an unmemorable performance, rushing for 0 yards and leaving in the second half with a knee injury. This was Gore's first game with 0 rushing yards. He would return the next game, where he would redeem himself against the Arizona Cardinals, where he rushed for 88 yards and a touchdown. Next week, however, he rushed for only 39 yards against the Baltimore Ravens powerful defense in 49ers 6–16 loss. The next game, however, proved to be a 49ers win against the St. Louis Rams, where Gore became the 49ers' all-time leading yardage rusher, surpassing Joe Perry; he rushed for 73 yards on the game. The next week Gore performed well despite losing the game 19–21, rushing for 72 yards and the 49ers only touchdown. He managed to finish the season on a high note, with a three-game winning streak, including one against the Pittsburgh Steelers, where he rushed 65 yards and a touchdown. He finished the season with 1,211 yards, having had five seasons with at least 1,000 rushing yards. During the playoffs, Gore performed exceedingly well, helping the 49ers set up a touchdown by rushing for 42 yards in the Divisional Round in his playoff debut against the New Orleans Saints; he had a total of 89 yards in the game. During the NFC Championship, Gore rushed for 74 yards in the 20–17 overtime loss to the New York Giants. Gore began the 2012 season with a huge performance against the Green Bay Packers at Lambeau Field with 112 yards as the 49ers won by a score of 30–22. In Week 4, against the New York Jets, Gore had 64 yards along with a touchdown in a 34–0 blowout win in New York. The next week, he had 106 yards and a touchdown in 45–3 win against the Buffalo Bills. In Week 7, he was the crucial player in a San Francisco 13–6 win against division rivals Seattle Seahawks with 131 yards rushing in 16 carries and 51 yards on five receptions. In Week 15, against the New England Patriots, he recorded a nine-yard offensive fumble recovery for a touchdown. He had a seven-game streak with 50 rushing yards or more until it was snapped against the Seattle Seahawks in Seattle in a 42–13 loss. In the final regular season game, Week 17, against the Arizona Cardinals at Candlestick Park, Gore became the all-time team 49er franchise leader in rushing touchdowns (51) and won the Western division title. He ended the season with 1,214 yards on 258 carries and eight touchdowns. He was selected to play in the Pro Bowl, his fourth appearance. In the playoffs, the 49ers faced the Green Bay Packers once again, this time in the Divisiona Round at Candlestick Park. Gore had 119 yards and a score (his quarterback, Colin Kaepernick, had 181 yards rushing, the most ever by a quarterback in a single game). In the next round, the San Francisco 49ers visited the Georgia Dome to play against the top-seeded Atlanta Falcons in the NFC Championship. The game was completely dominated in the first quarter by the Falcons with wide receiver Julio Jones having 100 yards and the 49ers having only two yards. They went into halftime with the Falcons leading 24–14. The game ended up with the San Francisco 49ers winning 28–24 when NaVorro Bowman made a stellar defensive play to stop the Falcons on 4th down inside the 49ers 10-yard line. In the victory, Gore had 90 rushing yards and two touchdowns allowing the 49ers to go to Super Bowl XLVII, their first Super Bowl since 1994. In the Super Bowl, Gore had 19 carries for 110 yards and a touchdown, but the 49ers fell behind early and couldn't come back, losing the game 34–31 to the Baltimore Ravens. Gore entered the season with a lot questions about his age having turned 30 during the offseason. He responded by having a great season playing in all 16 regular season games. Gore's season got off to a slow start, only rushing for 60 yards in the first two weeks of the season. A Week 3 loss to the Indianapolis Colts in which he had 82 rushing yards on only 11 carries had the media questioning why the team was not running the ball more. In Week 4, Gore had a big game rushing for 153 yards and a touchdown on 20 carries. 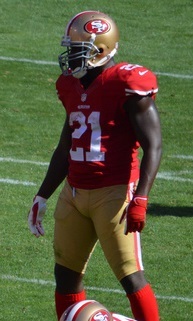 Gore and the running game led the 49ers to five straight victories. In Week 14, he had a 51-yard rush with four minutes left that help secure a 19–17 win against the Seattle Seahawks. In 2013, Gore had three 100-yard games and finished with 1,128 yards and nine touchdowns on 279 carries. In the 13-20 Wild Card Round victory over the Green Bay Packers, he rushed for 66 yards and a touchdown. In the 23-10 Divisional Round victory over the Carolina Panthers, he had 84 rushing yards. In the 23-17 NFC Championship loss to the Seattle Seahawks, he had 14 rushing yards. Gore became the 29th player to reach the 10,000 career rushing yard mark in the first game of the season, with 66 yards against the Dallas Cowboys. The 49ers went away from the running game until Week 4, when Gore rushed for 119 yards on 24 carries, and also had a career long 55-yard receiving touchdown against the Philadelphia Eagles. The next week he rushed for 107 yards on 18 carries against the Kansas City Chiefs. The 8–8 49ers struggled all season to find an identity, and featured Gore's running game prominently after being eliminated from the playoffs. He rushed for 158 yards and a season-long 52-yard touchdown on 26 carries as the 49ers lost in overtime to the San Diego Chargers in Week 16 by a score of 35–38, and in his final game with the 49ers, he rushed for 144 yards on 25 carries as the 49ers beat the Arizona Cardinals by a score of 20–17. Gore finished the season with 255 carries, 1,106 rushing yards, and four touchdowns, and became the 20th player in NFL history to rush for 11,000 career rushing yards, moving up from 29th place on the all-time rushing yards leaderboard at the start of the season. On March 10, 2015, Gore signed a three-year, $12 million contract with the Indianapolis Colts. His contract includes $8.5 million in guarantees. Prior to signing with the Colts, it was widely reported that Gore had agreed to a deal with the Philadelphia Eagles on March 9 to replace LeSean McCoy. However, the following day several sources claimed that Gore had second thoughts about his agreement, and instead signed with Indianapolis. Gore enjoyed a respectable season, but 2015 marked the first season Gore played all 16 games and missed the 1,000-yard mark. Gore finished ninth in the league in rushing yards with 967 and had six touchdowns, while also adding 267 receiving yards and a receiving touchdown. Gore's best game was against the Miami Dolphins, where quarterback Matt Hasselbeck was injured in what was the final game of his career. Gore stepped up to engineer an 18–14 win with 85 rushing yards on 15 carries with two rushing touchdowns. He moved up five more places to 15th all-time in rushing yards, and also passed Steven Jackson in early October to become the NFL's active leader in career rushing yards. In Week 1, Gore carried the ball 14 times for 59 yards in a shootout against the Detroit Lions. In Week 2, the Colts faced the Super Bowl 50 Champion Denver Broncos and their vaunted defense. Gore did not have a great showing, rushing for 44 yards on 13 carries, but did have a touchdown reception. Gore had a better game in Week 3, rushing for 82 yards and a touchdown. On October 9, Gore surpassed Jim Brown in career rushing yards. Gore would carry that momentum into Week 6, rushing for 106 yards on 22 carries to become the Colts' first 100-yard rusher in 55 games. After the game, Gore voiced his frustration with the team losing, saying "I didn't come here for this, I came here to get into the tournament." In Week 8, Gore tied Terrell Owens, Marvin Harrison, Tim Brown, Cris Carter, Jerry Rice, and Don Hutson for the most consecutive seasons (11) with at least five touchdowns. In Week 15 against the Minnesota Vikings' third ranked defense Gore would hit the century mark for the second time this season, rushing for 101 yards on 26 carries. Gore finished the season with 1,025 rushing yards and eight touchdowns. This was the ninth time Gore has rushed for 1,000 yards in his career. He joined Pro Football Hall of Famers Emmitt Smith (11), Curtis Martin (10), Walter Payton (10) and Barry Sanders (10) as the only players in NFL history to rush for 1,000 yards in at least nine different seasons. He also became the Colts first running back to rush for 1,000 yards since Joseph Addai in 2007. He moved up seven more places to 8th on the all-time career rushing list. The 2017 offseason, Gore trained for the season in a familiar fashion, down in Miami working out with younger running backs from around the league. The Colts brought in competition at the running back position drafting Marlon Mack to compete for the starting job. Gore embraced the competition saying "to have depth to compete, I feel like everybody should have depth to compete at their position. The more people you've got, the hungrier that person should be. You know the guys from last year and adding the new young guys come training camp time the best man should win. If you love this game you're gonna step up to the plate." In the season opener, Andrew Luck's shoulder injury prevented him from playing so the offense struggled against the Los Angeles Rams, losing 46–9, and Gore would only get 10 rushing attempts for 42 yards. In Week 2, in a 16–13 overtime loss to the Arizona Cardinals, Gore rushed for 46 yards and his first rushing touchdown of the 2017 season, moving him into the top 25 all-time for career rushing touchdowns. This was followed by 57 yards and a touchdown in Week 3 win over the Cleveland Browns, then four consecutive games under 50 yards, before 82-, 51-, and 54-yard performances in Weeks 8 through 10, all with zero touchdowns over the seven-game span. After the bye, Gore had 62 yards and a touchdown in Week 12, and 61 yards in Week 13 to pass both Jerome Bettis and LaDanian Tomlinson and move up to fifth on the all-time rushing list. Playing against the Buffalo Bills in a blizzard and deep snow in Week 14, Gore had a career-high 36 rush attempts for 130 yards, his highest yardage total in his three years with the Colts. Gore finished the season with 961 rushing yards, bringing his career total to 14,026. He became the fifth player in NFL history to amass 14,000 rushing yards in his career, joining Emmitt Smith, Walter Payton, Barry Sanders, and Curtis Martin. On March 1, 2018, the Colts announced that they would not re-sign Gore, allowing him to become a free agent at the start of the new league year. On March 22, 2018, Gore signed a one-year contract with the Miami Dolphins. With his five-yard rush in the third quarter of the Miami Dolphins' win over the New York Jets, in Week 2 of the 2018 season, Frank Gore passed Curtis Martin for fourth-most rushing yards all time with 14,103. In Week 4, against the New England Patriots, he caught a touchdown from Brock Osweiler. In the Week 6 overtime victory over the Chicago Bears, Gore recorded 15 carries for 101 rushing yards. In Week 15, Gore suffered a sprained foot and was ruled out for the rest of the season. Overall, Gore finished with 722 rushing yards. The 2018 season was the first time in his career he did not record a rushing touchdown. On March 13, 2019, Gore signed a one-year, $2 million contract with the Buffalo Bills. First player in NFL history with 12 consecutive 1,200-yards from scrimmage seasons. One of five RBs in NFL history with nine 1,000-yard seasons, joining Emmitt Smith, Walter Payton, Barry Sanders, & Curtis Martin. One of five RBs in NFL history with 14,000 career rushing yards, joining Emmitt Smith, Walter Payton, Barry Sanders, and Curtis Martin. NFL #4 all-time in career rushing yards. ^ Rosenthal, Gregg. "San Francisco 49ers headed to Super Bowl XLVII". Around The League. NFL. Retrieved January 21, 2013. ^ Holder, Stephen (October 2, 2015). "The making of Frank Gore: 'I've been through so much'". Indianapolis Star. Retrieved February 3, 2018. ^ "2008 Miami-Dade High School Football". MiamiHerald.com. ^ "Frank Gore College Stats". College Football at Sports-Reference.com. Retrieved February 3, 2018. ^ "Miami (FL) at Penn State Box Score, September 1, 2001". Sports Reference. Retrieved September 20, 2017. ^ "Rutgers at Miami (FL) Box Score, September 8, 2001". Sports Reference. Retrieved September 20, 2017. ^ "West Virginia at Miami (FL) Box Score, October 25, 2001". Sports Reference. Retrieved September 20, 2017. ^ "Temple at Miami (FL) Box Score, November 3, 2001". Sports Reference. Retrieved September 20, 2017. ^ "Washington at Miami (FL) Box Score, November 24, 2001". Sports Reference. Retrieved September 20, 2017. ^ "Frank Gore 2001 Game Log". Sports Reference. Retrieved September 20, 2017. ^ "Miami Hurricanes 2002 Preview". www.nationalchamps.net. ^ "Miami (FL) at Louisiana Tech Box Score, August 28, 2003". Sports Reference. Retrieved September 20, 2017. ^ "Florida at Miami (FL) Box Score, September 6, 2003". Sports Reference. Retrieved September 20, 2017. ^ "East Carolina at Miami (FL) Box Score, September 13, 2003". Sports Reference. Retrieved September 20, 2017. ^ "Miami (FL) at Boston College Box Score, September 20, 2003". Sports Reference. Retrieved September 20, 2017. ^ "West Virginia at Miami (FL) Box Score, October 2, 2003". Sports Reference. Retrieved September 20, 2017. ^ Holder, Stephen (October 2, 2015). "The making of Frank Gore: 'I've been through so much'". The Indianapolis Star. Retrieved September 20, 2017. ^ "Frank Gore 2003 Game Log". Sports Reference. Retrieved September 20, 2017. ^ "Florida State at Miami (FL) Box Score, September 10, 2004". Sports Reference. Retrieved September 20, 2017. ^ "Louisiana Tech at Miami (FL) Box Score, September 18, 2004". Sports Reference. Retrieved September 20, 2017. ^ "Miami (FL) at Houston Box Score, September 23, 2004". Sports Reference. Retrieved September 20, 2017. ^ "Miami (FL) at Georgia Tech Box Score, October 2, 2004". Sports Reference. Retrieved September 20, 2017. ^ "Clemson at Miami (FL) Box Score, November 6, 2004". Sports Reference. Retrieved September 20, 2017. ^ "Miami (FL) at Virginia Box Score, November 13, 2004". Sports Reference. Retrieved September 20, 2017. ^ "Peach Bowl – Miami (FL) vs Florida Box Score, December 31, 2004". Sports Reference. Retrieved September 20, 2017. ^ "Frank Gore Career Game Log". College Football at Sports-Reference.com. Retrieved February 3, 2018. ^ "SAN FRANCISCO 49ers". Archived from the original on October 5, 2007. ^ "2005 NFL Draft Listing". Pro-Football-Reference.com. Retrieved September 20, 2017. ^ "2005 San Francisco 49ers Statistics & Players". Pro-Football-Reference.com. Retrieved February 3, 2018. ^ "Frank Gore Stats". Pro-Football-Reference.com. ^ "Dexter Carter Stats". Pro-Football-Reference.com. ^ "Roger Craig Stats". Pro-Football-Reference.com. ^ "St. Louis Rams at San Francisco 49ers – September 11th, 2005". Pro-Football-Reference.com. Retrieved November 1, 2017. ^ "Dallas Cowboys at San Francisco 49ers – September 25th, 2005". Pro-Football-Reference.com. Retrieved November 1, 2017. ^ "San Francisco 49ers at Washington Redskins – October 23rd, 2005". Pro-Football-Reference.com. Retrieved November 1, 2017. ^ "San Francisco 49ers at Chicago Bears – November 13th, 2005". Pro-Football-Reference.com. Retrieved November 1, 2017. ^ "San Francisco 49ers at Jacksonville Jaguars – December 18th, 2005". Pro-Football-Reference.com. Retrieved November 1, 2017. ^ "San Francisco 49ers at St. Louis Rams – December 24th, 2005". Pro-Football-Reference.com. Retrieved November 1, 2017. ^ "Houston Texans at San Francisco 49ers – January 1st, 2006". Pro-Football-Reference.com. Retrieved November 1, 2017. ^ King, Peter. "Frank Gore: What I've Learned from Football". SI.com. Retrieved December 4, 2018. ^ "Sensational Sophmores (Frank Gore)". www.procanes.com. Retrieved March 8, 2019. ^ a b c "Frank Gore". NFL.com. ^ "Seattle Seahawks at San Francisco 49ers – November 19th, 2006". Pro-Football-Reference.com. Retrieved November 1, 2017. ^ "San Francisco 49ers at Detroit Lions – November 12th, 2006". Pro-Football-Reference.com. Retrieved February 3, 2018. ^ "Seattle Seahawks at San Francisco 49ers – November 19th, 2006". Pro-Football-Reference.com. Retrieved February 3, 2018. ^ "San Francisco 49ers at St. Louis Rams – November 26th, 2006". Pro-Football-Reference.com. Retrieved February 3, 2018. ^ "San Francisco 49ers Single-Season Rushing Leaders". Pro-Football-Reference.com. Retrieved February 3, 2018. ^ "2006 San Francisco 49ers Statistics & Players". Pro-Football-Reference.com. Retrieved February 3, 2018. ^ "Turner"s choice: Cowboys or 49ers". Monterery Herald. January 28, 2007. ^ "Gore's goal: 2,200 yards". The Mercury News. January 2, 2007. Retrieved March 8, 2019. ^ "San Francisco 49ers at St. Louis Rams – September 16th, 2007". Pro-Football-Reference.com. Retrieved November 1, 2017. ^ "San Francisco 49ers at Arizona Cardinals – November 25th, 2007". Pro-Football-Reference.com. Retrieved November 1, 2017. ^ "Frank Gore 2007 Game Log". Pro-Football-Reference.com. Retrieved February 3, 2018. ^ "Cardinals vs. 49ers – Box Score – September 7, 2008 – ESPN". ESPN.com. ^ "Lions vs. 49ers – Box Score – September 21, 2008 – ESPN". ESPN.com. ^ "49ers vs. Saints – Box Score – September 28, 2008 – ESPN". ESPN.com. ^ "Eagles vs. 49ers – Box Score – October 12, 2008 – ESPN". ESPN.com. ^ "Frank Gore bio". Archived from the original on August 22, 2009. Retrieved December 12, 2009. ^ "Frank Gore 2008 Game Log". Pro-Football-Reference.com. Retrieved February 3, 2018. ^ "2009 San Francisco 49ers Statistics & Players". Pro-Football-Reference.com. Retrieved November 1, 2017. ^ "San Francisco 49ers at Arizona Cardinals – September 13th, 2009". Pro-Football-Reference.com. Retrieved February 3, 2018. ^ "Seattle Seahawks at San Francisco 49ers – September 20th, 2009". Pro-Football-Reference.com. Retrieved February 3, 2018. ^ "Seahawks vs. 49ers – Game Recap – September 20, 2009 – ESPN". ESPN.com. ^ "Bears vs. 49ers – Game Recap – November 12, 2009 – ESPN". ESPN.com. ^ Crumpacker, John (December 1, 2009). "Spread offense – as in, spread the credit around". The San Francisco Chronicle. ^ "Cardinals vs. 49ers – Box Score – December 14, 2009 – ESPN". ESPN.com. ^ "San Francisco 49ers at Philadelphia Eagles – December 20th, 2009". Pro-Football-Reference.com. Retrieved November 1, 2017. ^ Sando, Mike (December 30, 2009). "49ers' three Pro Bowl alternates". ESPN.com. ^ "San Francisco 49ers at Kansas City Chiefs - September 26th, 2010". Pro-Football-Reference.com. Retrieved March 8, 2019. ^ "49ers announce Frank Gore has broken hip". National Football Post. Archived from the original on December 3, 2010. ^ "Frank Gore 2010 Game Log". Pro-Football-Reference.com. Retrieved February 3, 2018. ^ McCauley, Janie. "FBN, 49ers, Gore". Archived from the original on December 15, 2018. Retrieved August 30, 2011. ^ "2011 San Francisco 49ers Statistics & Players". Pro-Football-Reference.com. Retrieved February 3, 2018. ^ "2011 NFL Standings & Team Stats". Pro-Football-Reference.com. Retrieved February 3, 2018. ^ "San Francisco 49ers at Philadelphia Eagles – October 2nd, 2011". Pro-Football-Reference.com. Retrieved November 1, 2017. ^ "Tampa Bay Buccaneers at San Francisco 49ers – October 9th, 2011". Pro-Football-Reference.com. Retrieved November 1, 2017. ^ "San Francisco 49ers at Detroit Lions – October 16th, 2011". Pro-Football-Reference.com. Retrieved November 1, 2017. ^ "Cleveland Browns at San Francisco 49ers – October 30th, 2011". Pro-Football-Reference.com. Retrieved November 1, 2017. ^ "San Francisco 49ers at Washington Redskins – November 6th, 2011". Pro-Football-Reference.com. Retrieved November 1, 2017. ^ "New York Giants at San Francisco 49ers – November 13th, 2011". Pro-Football-Reference.com. Retrieved February 3, 2018. ^ "Arizona Cardinals at San Francisco 49ers – November 20th, 2011". Pro-Football-Reference.com. Retrieved November 1, 2017. ^ "San Francisco 49ers at Baltimore Ravens – November 24th, 2011". Pro-Football-Reference.com. Retrieved November 1, 2017. ^ "San Francisco 49ers at Arizona Cardinals – December 11th, 2011". Pro-Football-Reference.com. Retrieved November 1, 2017. ^ "Pittsburgh Steelers at San Francisco 49ers – December 19th, 2011". Pro-Football-Reference.com. Retrieved November 1, 2017. ^ "Frank Gore 2011 Game Log". Pro-Football-Reference.com. Retrieved February 3, 2018. ^ "Divisional Round – New Orleans Saints at San Francisco 49ers – January 14th, 2012". Pro-Football-Reference.com. Retrieved November 1, 2017. ^ "NFC Championship – New York Giants at San Francisco 49ers – January 22nd, 2012". Pro-Football-Reference.com. Retrieved November 1, 2017. ^ "San Francisco 49ers at Green Bay Packers – September 9th, 2012". Pro-Football-Reference.com. Retrieved November 3, 2017. ^ "San Francisco 49ers at New York Jets – September 30th, 2012". Pro-Football-Reference.com. Retrieved November 3, 2017. ^ "Buffalo Bills at San Francisco 49ers – October 7th, 2012". Pro-Football-Reference.com. Retrieved November 3, 2017. ^ "Seattle Seahawks at San Francisco 49ers – October 18th, 2012". Pro-Football-Reference.com. Retrieved November 3, 2017. ^ "San Francisco 49ers at New England Patriots - December 16th, 2012". Pro-Football-Reference.com. Retrieved March 8, 2019. ^ "San Francisco 49ers at Seattle Seahawks – December 23rd, 2012". Pro-Football-Reference.com. Retrieved November 3, 2017. ^ "Frank Gore 2012 Game Log". Pro-Football-Reference.com. Retrieved November 3, 2017. ^ "Divisional Round – Green Bay Packers at San Francisco 49ers – January 12th, 2013". Pro-Football-Reference.com. Retrieved November 3, 2017. ^ "NFC Championship – San Francisco 49ers at Atlanta Falcons – January 20th, 2013". Pro-Football-Reference.com. Retrieved November 3, 2017. ^ "Super Bowl XLVII – San Francisco 49ers vs. Baltimore Ravens – February 3rd, 2013". Pro-Football-Reference.com. Retrieved November 3, 2017. ^ "Green Bay Packers at San Francisco 49ers – September 8th, 2013". Pro-Football-Reference.com. Retrieved November 3, 2017. ^ "San Francisco 49ers at Seattle Seahawks – September 15th, 2013". Pro-Football-Reference.com. Retrieved November 3, 2017. ^ "Indianapolis Colts at San Francisco 49ers – September 22nd, 2013". Pro-Football-Reference.com. Retrieved November 3, 2017. ^ "San Francisco 49ers at St. Louis Rams – September 26th, 2013". Pro-Football-Reference.com. Retrieved November 3, 2017. ^ "Seattle Seahawks at San Francisco 49ers – December 8th, 2013". Pro-Football-Reference.com. Retrieved November 3, 2017. ^ "Frank Gore 2013 Game Log". Pro-Football-Reference.com. Retrieved November 3, 2017. ^ "Wild Card - San Francisco 49ers at Green Bay Packers - January 5th, 2014". Pro-Football-Reference.com. Retrieved March 8, 2019. ^ "Divisional Round - San Francisco 49ers at Carolina Panthers - January 12th, 2014". Pro-Football-Reference.com. Retrieved March 8, 2019. ^ "NFC Championship - San Francisco 49ers at Seattle Seahawks - January 19th, 2014". Pro-Football-Reference.com. Retrieved March 8, 2019. ^ "San Francisco 49ers at Dallas Cowboys – September 7th, 2014". Pro-Football-Reference.com. Retrieved November 3, 2017. ^ Pentis, Andrew. "Frank Gore Crosses 10,000-yard Mark for 49ers Career". San Francisco 49ers. Archived from the original on November 7, 2017. Retrieved November 3, 2017. ^ "Philadelphia Eagles at San Francisco 49ers – September 28th, 2014". Pro-Football-Reference.com. Retrieved November 3, 2017. ^ "San Diego Chargers at San Francisco 49ers – December 20th, 2014". Pro-Football-Reference.com. Retrieved November 3, 2017. ^ "Arizona Cardinals at San Francisco 49ers – December 28th, 2014". Pro-Football-Reference.com. Retrieved November 3, 2017. ^ a b c "Frank Gore Game Log". Pro-Football-Reference.com. Retrieved November 3, 2017. ^ Adams, Kipp (December 28, 2014). "Gore Eclipses 11,000 Career Rushing Yards, All With 49ers". San Francisco 49ers. Retrieved November 3, 2017. ^ Compare 2014 and 2013 career rushing yards leader boards. ^ "Frank Gore Contract Details, Salary Cap Breakdowns, Salaries, Bonuses". spotrac.com. Retrieved December 17, 2016. ^ Wesseling, Chris (March 10, 2015). "Frank Gore agrees to terms with Colts". NFL.com. Retrieved March 10, 2015. ^ Corbett, Jim (March 9, 2015). "Frank Gore to sign with Eagles, replace LeSean McCoy". USA Today. Retrieved March 10, 2015. ^ "2015 NFL Rushing & Receiving". Pro-Football-Reference.com. Retrieved February 3, 2018. ^ "Frank Gore 2015 Game Log". Pro-Football-Reference.com. Retrieved February 3, 2018. ^ "Indianapolis Colts at Miami Dolphins – December 27th, 2015". Pro-Football-Reference.com. Retrieved November 3, 2017. ^ "NFL Career Rushing Yards Leaders Through 2015". Pro-Football-Reference.com. Retrieved March 8, 2019. ^ "Detroit Lions at Indianapolis Colts – September 11th, 2016". Pro-Football-Reference.com. Retrieved November 3, 2017. ^ "Indianapolis Colts at Denver Broncos – September 18th, 2016". Pro-Football-Reference.com. Retrieved November 3, 2017. ^ "Frank Gore tip-toes his way into the end zone". NFL.com. Retrieved January 4, 2017. ^ Wells, Mike (October 9, 2016). "Frank Gore passes Jim Brown, now ranks ninth on all-time rushing list". espn.com. Retrieved January 4, 2017. ^ Stites, Adam (October 16, 2016). "Frank Gore became the Colts' 1st 100-yard rusher in 4 years twice in 1 night". sbnation.com. Retrieved January 4, 2017. ^ Patra, Kevin (October 17, 2016). "Colts RB Frank Gore: 'I didn't come here for this'". NFL.com. Retrieved January 4, 2017. ^ "Most consecutive seasons, five touchdowns". Pro-Football-Reference.com. Retrieved March 22, 2019. ^ "Indianapolis Colts at Minnesota Vikings – December 18th, 2016". Pro-Football-Reference.com. Retrieved November 3, 2017. ^ "Frank Gore 2016 Game Log". Pro-Football-Reference.com. Retrieved February 3, 2018. ^ Bowen, Kevin (January 1, 2017). "Frank Gore Achieves 1,000-Yard Season". Colts.com. Retrieved January 4, 2017. ^ "NFL Career Rushing Yards Leaders Through 2016". Pro-Football-Reference.com. Retrieved March 8, 2019. ^ "2017 NFL Draft Listing". Pro-Football-Reference.com. Retrieved February 3, 2018. ^ "Colts RB Frank Gore On Rookie Competition". Colts.com. Retrieved March 22, 2019. ^ "Indianapolis Colts at Los Angeles Rams – September 10th, 2017". Pro-Football-Reference.com. Retrieved November 3, 2017. ^ "Arizona Cardinals at Indianapolis Colts – September 17th, 2017". Pro-Football-Reference.com. Retrieved October 14, 2017. ^ Rosenthal, Gregg. "Frank Gore passes Tomlinson on all-time rushing list". NFL.com. Retrieved March 22, 2019. ^ "Indianapolis Colts at Buffalo Bills – December 10th, 2017". Pro-Football-Reference.com. Retrieved February 3, 2018. ^ "Frank Gore 2017 Game Log". Pro-Football-Reference.com. Retrieved February 3, 2018. ^ "NFL Rushing Yards Career Leaders". Pro-Football-Reference.com. Retrieved February 3, 2018. ^ Bergman, Jeremy (March 1, 2018). "Colts moving on from veteran running back Frank Gore". NFL.com. Retrieved February 3, 2018. ^ Smith, Michael David (March 22, 2018). "Dolphins sign Frank Gore". ProFootballTalk.NBCSports.com. Retrieved March 8, 2019. ^ Hightower, Kyle (September 30, 2018). "Patriots Stop Skid, Hand Dolphins First Loss In 38–7 Rout". WBUR. Retrieved October 17, 2018. ^ McPherson, Jordan (October 14, 2018). "The Dolphins' Frank Gore gave yet another reminder that he's a 'warrior' even in Year 14". Miami Herald. Retrieved October 17, 2018. ^ Patra, Kevin (December 17, 2018). "Dolphins RB Frank Gore (foot) out for rest of season". NFL.com. Retrieved March 8, 2019. ^ "Frank Gore Placed On IR, Kendrick Norton Signed". MiamiDolphins.com. December 19, 2018. Retrieved March 22, 2019. ^ "Frank Gore 2018 Game Log". Pro-Football-Reference.com. Retrieved February 1, 2019. ^ Smith, Michael David (March 11, 2019). "Frank Gore Heads to Buffalo". ProFootballTalk.NBCSports.com. Retrieved March 13, 2019. ^ Brown, Chris (March 13, 2019). "Offense dominates Bills initial wave of 2019 free agent additions". BuffaloBills.com. Retrieved March 22, 2019. ^ "Most Improved Player of the Year". PFWA. Retrieved December 4, 2018. ^ "Frank Gore wins Art Rooney Sportsmanship Award". IndyStarSports. 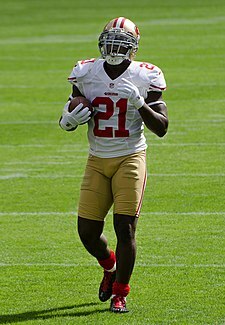 ^ "Another game, another NFL milestone for Frank Gore". SI.com. Retrieved December 4, 2018. ^ "Consecutive Seasons with 600+ Rushing Yards". Pro-Football-Reference.com. ^ "Consecutive Seasons with 700+ Rushing Yards". Pro-Football-Reference.com.